Fruit juices are addition to well balanced diet providing essential nutrients like vitamin, minerals, protein, potassium and folates. Fruit juices are essential for children and adults for covering daily needs of energy and nutrients. Among them, orange juice is the most commonly consumed fruit juice. Orange juice refers to the juice of oranges. It is made by extraction from the fresh fruit and it is one of best fruit recipe. We can take orange juice in breakfast and even in lunch hours. A glass of freshly squeezed orange juice is very useful with sugar-loaded, fat free food that prvent your wrinkle free skin, clog your arteries, increase risk factor of cancer, keep you young forever. Orange juice is rich in Vitamin C (Absorbic Acid), carbohydrate, fructose, Calcium, Vitamin D, hesperidine and so on. Daily drink of fresh orange juice is recommended for balanced diet. A cup serving of raw, fresh orange juice, amounting to 248 g or 8 ounces, has 124 mg of vitamin C (>100% RDI). It has 20.8 g of sugars and has 112 Calories. It also supplies potassium, thiamin, and folate. Orange juice is rich source of sugar fructose. Sugar also boost up the immune system. orange juice not only rich in nutrition, it is reasonable healthy diet. white blood cells are reason for building immune response against pathogens. Higher the WBC better your immunity. Orange is the rich source of Vitamin c. Higher sugar content of orange prevents your body from absorbing Vitamin C.Drinking juice of orange increases the amount of vitamin c (Absorbic acid) you need. Glucose and high fat meal induce inflammatory reacion. The intake of orange juice, together with a high-carbohydrate, high-fat meal, prevents the occurrence of inflammation within the body, making it a good preventive measure against the development of insulin resistance and atherosclerosis. Orange juice improved diastolic blood pressure of our body. Orange juice contains hesperidin which is water soluble healthy plant pigment. Hesperidin serves improving small blood vessels, blood pressure and decrease risk of cardiovascular disease. 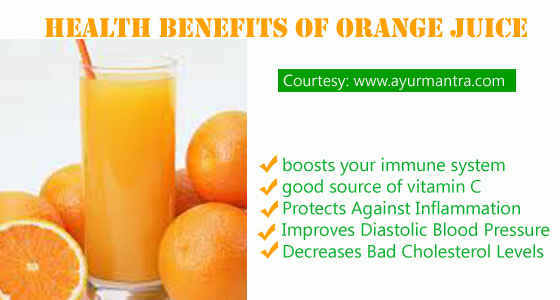 Orange juice helps to maintain the blood cholesterol level. It lead to decrease level of low density lipoprotein cholesterol in patients with high cholesterol level. It balance the mechanism of blood cholesterol and establish the mechanism of cholesterol balance.